We always knew it to be true, but the rest of the world finally got a clue last week! 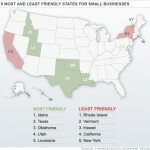 Idaho is a terrific place to start a small business. This article (top right) is “clipped” from the front page of the Wednesday May 9 2012 edition of the Coeur d’Alene Press. 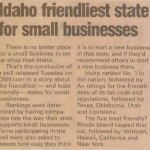 This entry was posted in Business, Commercial, Idaho, Market News, Poll, State of Idaho and tagged 2012, cnn, CNN Money, Coeur d'Alene Press, Idaho, May, Poll, rankings, Small business, state, United States. Bookmark the permalink.